The Oceanic ProPlus X won the 2017 Testers Choice Award for console computers from ScubaLab, and it’s easy to see why. With its easy functionality, crystal-clear display, and long battery life, the Oceanic ProPlus X offers everything a diver needs in a simple, streamlined unit that is easy to use and keeps crucial information at your fingertips. The unique dual-algorithm feature of the ProPlus X is ideal for diving with a friend because it allows you to choose either the Pelagic DSAT or Pelagic Z+ decompression algorithm. This choice of algorithms means that you can set the ProPlus X to calculate ascents that match those of your companion, keeping you together regardless of which dive computer your friends are using. The dual-algorithm feature is also perfect for instructors, who work with students with different gear, and have to keep themselves and their students safe during ascent. The ease of use, crisp graphics, and useful features of the Oceanic ProPlus X make it a popular choice among both new and experienced divers. The Oceanic Pro Plus X was put through its paces by the guys over at ScubaLab. In the video below you will find out why this dive computer got the Tester Choice in the dive computer tests for 2017. The display boasts a vibrant color screen offers excellent readability underwater, with a thin film transistor that preserves battery life. The four-button operation and navigation of onscreen menus are so logical and easy to understand that many divers barely need to use the manual. Not only does the choice of Pelagic DSAT or Pelagic Z+ allow divers to choose which algorithm is right for them, but it also allows divers to match their dive profile to those of companions using different dive computers. With the ProPlus X, divers can stay with their buddies for longer. Excellent display, crisp graphics, easy 4 button navigation. Strong capabilities, but without some of the more advanced technical functions of other dive computers. Logical menus and simple settings make it easy to use without relying on the manual. Extremely expensive for the feature set. The ProPlus X is incredibly easy to use, easy to operate, and easy to read in all conditions. The twist-and-go quick disconnect feature allows you to keep the ProPlus X safe between dives, and Bluetooth 4.0 quickly transmits data to the DiverLog app. The biggest drawback for the Oceanic ProPlus X is the price. It’s among the most expensive dive computers on the market, and yet lacks some of the advanced features and capabilities of lower-priced competitors. While it is an outstanding dive computer, and arguably the best console model available, the price is a reason to pause and rethink. If a diver needs advanced technical capabilities and custom features, there are other highly technical dive computers available at a lower cost. If a diver wants a simple computer that is easy to understand and operate, there are other simple dive computers available at a much lower cost. The design of the ProPlus X tends to elicit strong opinions among divers. Some people feel that wrist computers are easier to monitor while keeping your hands free during a dive. Others feel that console designs are easier to operate with larger buttons, and that consoles give more accurate compass readings. And some divers don’t like air integration with a hose, due to the risk of mechanical failure, while some feel that it’s more reliable by not relying on wireless data signals. These questions attract compelling arguments for and against console dive computers. 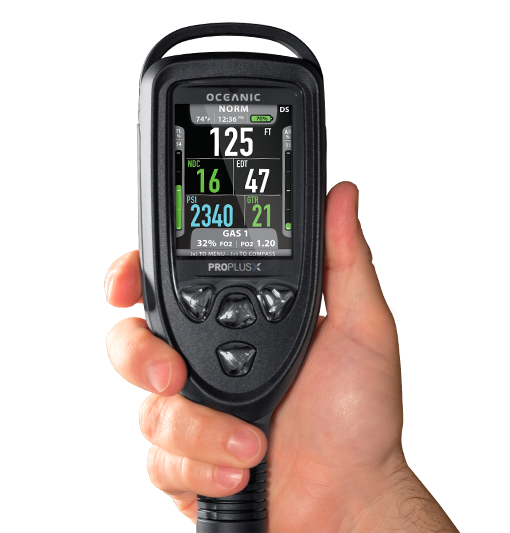 However, for those who prefer a console dive computer, and who want enough information to make their dive enjoyable and safe, the Oceanic ProPlus X is one of the best on the market. The excellent display, easy use and intuitive interface, and ability to choose algorithms make this an exceptionally popular model for beginners and more experienced recreational divers. And instructors love it when working with students. The Oceanic ProPlus X doesn’t offer many of the advanced features that technical divers need, and yet it is priced above many of the most technically advanced dive computers on the market. Yes, it ships with the quick-disconnect hose included. How many dives can I get on a single charge? The batteries should last you about 35-60 hours on a single dive. There is no doubt that the Oceanic ProPlus X is an excellent dive computer. Reviewers love the exceptional display and the easy, intuitive interface. However, the purchase price warrants some additional consideration about whether this is the right model for either new or experienced divers. It’s a fantastic investment for instructors who require the dual algorithm feature, but other divers may want to wait until the price comes down or consider whether it’s a good investment for them.